This plant is one of my all-time favourites. It's tall and elegantly green for most of the summer. Then, come mid-August– just as you're feeling desperate for a little color– the soft lavender flowers begin to open. 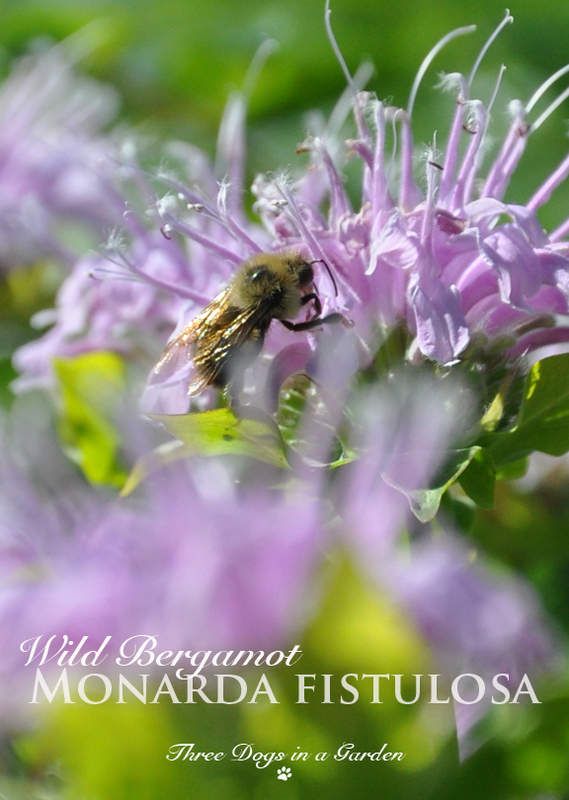 Wild Bergamot, Monarda fistulosa is North American native that can be found in fields and along roadsides. 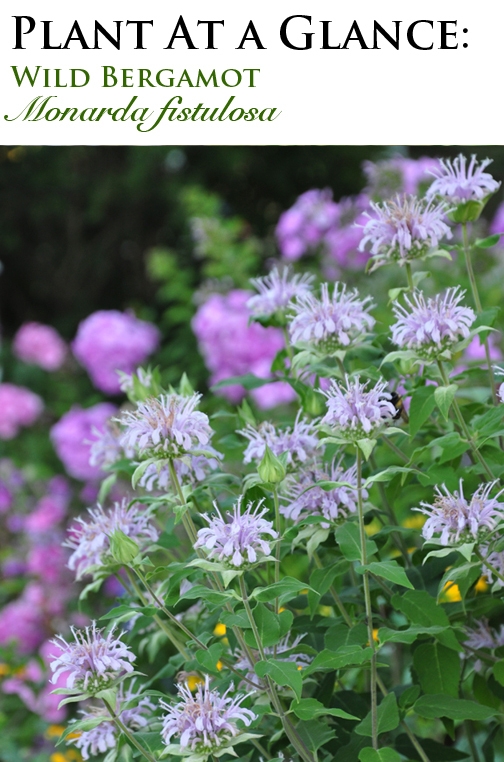 It's a member of the mint family (Lamiaceae), but don't worry, it's a clump-forming perennial. 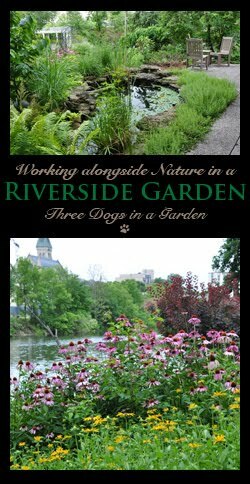 It does spread slowly by underground rhizomes, but the plant's roots are near to the surface of the soil and are easy to remove where unwanted. 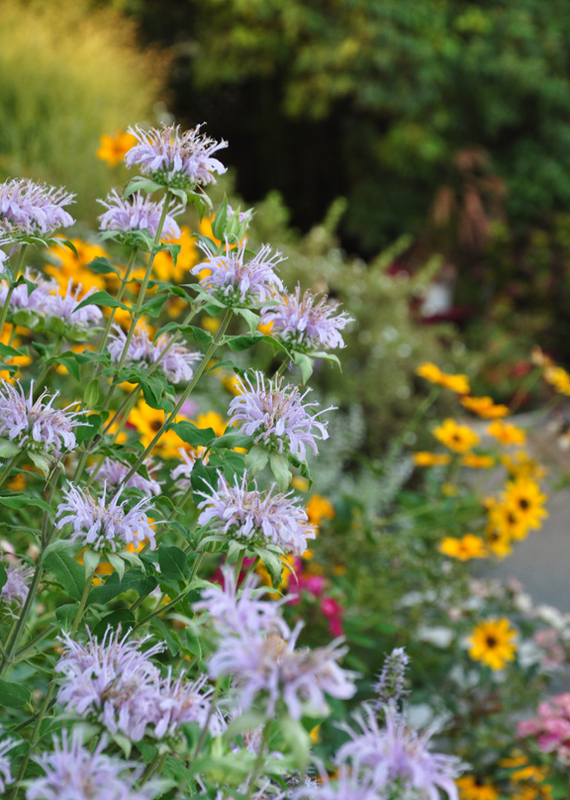 Give this plant full sun with a little afternoon shade in southern garden zones. 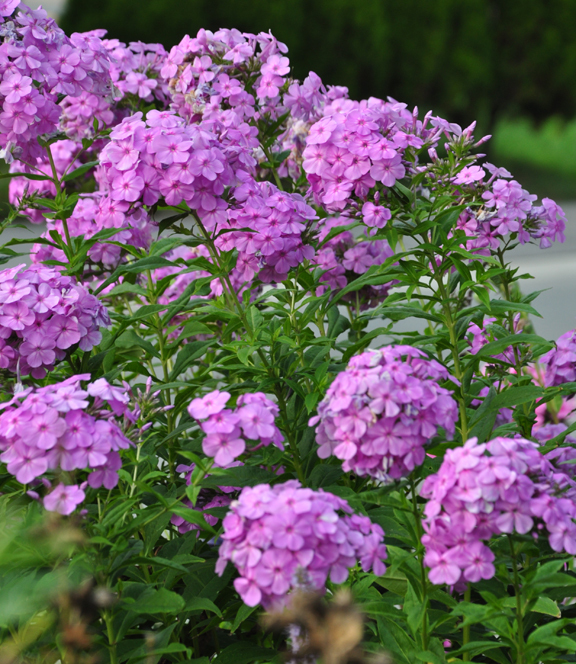 You'll find it's not a fussy plant and is quite happy in average garden soil. It will even tolerate quite poor soil and dry conditions. 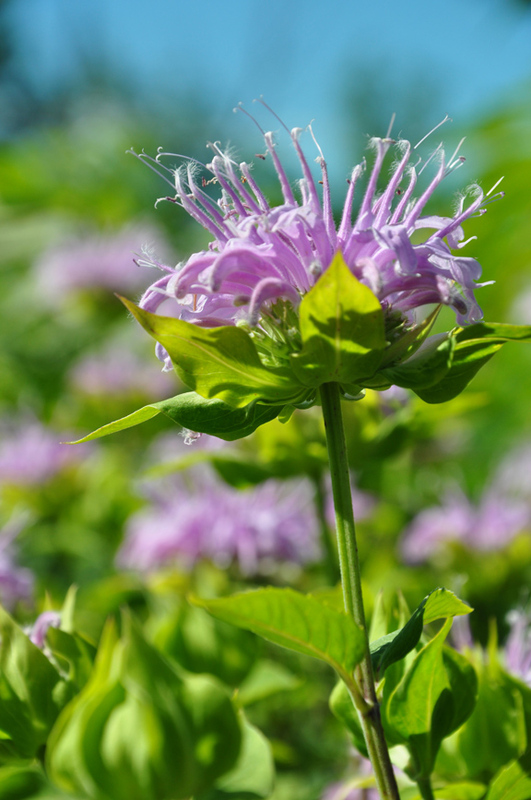 Monarda fistulosa is a skyscraper that can reach up to 5 feet. Unlike modern hybrids, Monarda fistulosa is more prone to outbreaks of powdery mildew, but I have yet to have a problem (Perhaps this is because my garden is quite dry in the summer. 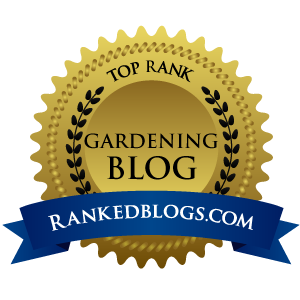 If your garden gets lots of rain, you may have more of an issue with powdery mildew). 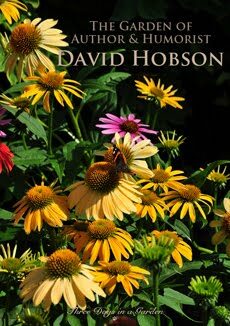 There is always the hum of bees around this perennial. 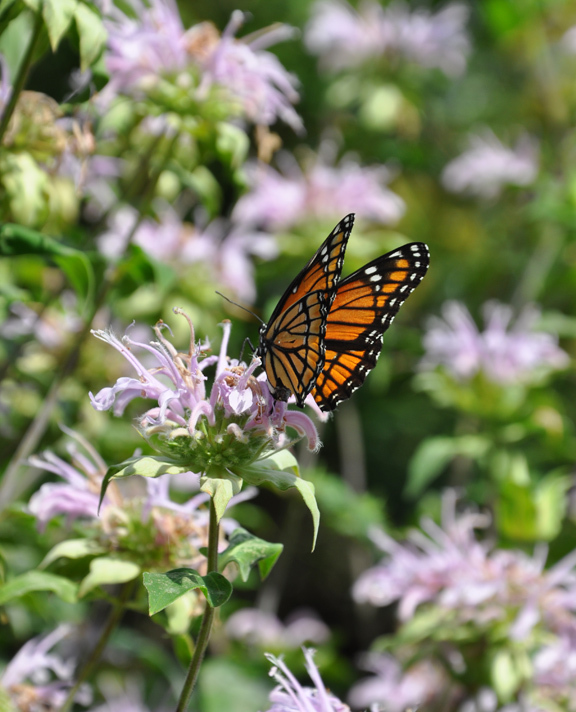 Butterflies love it too. seen in the background of the previous picture. The leaves and flowers of this plant are edible and can be used in both salads and cooked dishes. The dried leaves and flowers can also be used to make an aromatic tea. It is lovely ... and I do believe I have the right spot for it as well. The heart wants , what the garden heart wants ! You may be pleasantly surprised Joy. It is a very tall, upright plant, so you may be able to squeeze in a small clump. I hope you don't end up with a problem Pam! It has been dry again here this summer, so my problem has been hydration rather than powdery mildew. What a gorgeous flower! I will have to look into adding this to the garden. Hopefully the powdery mildew won't be a problem. I love the color! 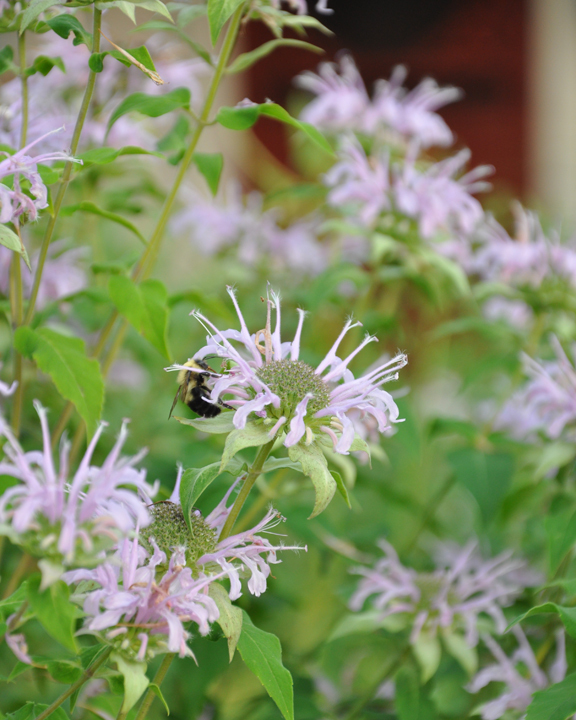 I think you'll find it is a nice Monarda Karen. The red type can look pretty ratty when the flowers start to fade. 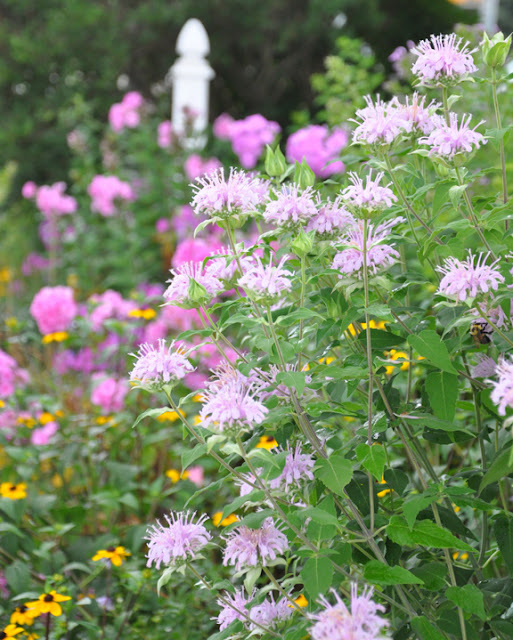 I think this Monarda is much more pleasing to look at as the flowers go over. This Monarda makes me wonder what other wildflowers I have been missing out on Gail.